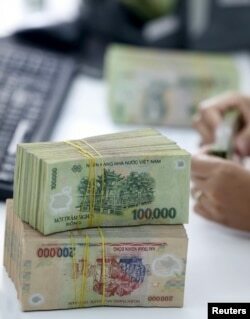 FILE - A man counts money he withdrew from an ATM machine at the headquarters of the Bank for Investment and Development of Vietnam in Hanoi. 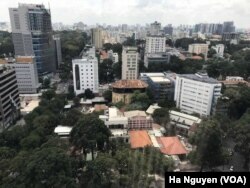 Foreign companies have been flocking to Vietnam. Earlier this year, one of the world’s biggest private equity firms Warburg Pincus added banking and logistics to its Vietnam portfolio, pushing its total investment into the country over the $1 billion mark. Auto players like JAC Motors of China, as well as Kamaz, the largest truck maker in Russia, have recently turned to Vietnam. The Southeast Asian country is seeing money pour in from all over the globe, whether it’s Indonesia’s Gojek in ride-hailing, or Qatar's Ooredoo in telecommunications. FILE - The Ho Chi Minh City skyline is rapidly changing as Vietnam enjoys some of the highest economic growth rates in the world. On the surface, Vietnam’s communist system would not sound like an appeal for investors. But many actually cite the political stability, albeit through one-party government, as a reason to come here. And in reality most businesses operate in a free market, with some state controls. 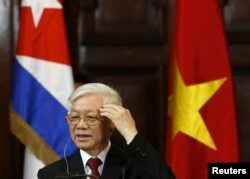 “There will be no major change in Vietnam's economic strategy or political system as a result of the passing of President Tran Dai Quang,” said Carl Thayer, emeritus politics professor, the University of New South Wales at the Australian Defense Force Academy. Also drawing in businesses are Vietnamese shoppers. Consumer confidence was higher in Vietnam than in Thailand, Malaysia and Singapore, market researcher Nielsen reported in March. As citizens’ incomes rise, their spending attracts brands in all manner of products. Spanish fashion retailer Zara has opened outlets here, while Apple in September appointed its first premium reseller in the country, EDigi, authorized to do official repairs of iPhones and Macs. Vingroup, a conglomerate founded by Vietnam’s richest man, launched a line of cars this month with some promotional juice from soccer star David Beckham. It’s not all coming up roses, of course. Economists say Vietnam needs to keep an eye on borrowing: consumers are using more credit cards, the government is close to its debt ceiling, and banks have more non-performing loans than desired. The real estate sector is also cooling, and the country wants to avoid any of the flak that comes from the trade war between the U.S. and China. That trade war has made investors bearish on Asia’s biggest economy. Elsewhere in the region, Indonesia is fighting to hold the value of its currency, as investors abscond to take advantage of higher U.S. interest rates.